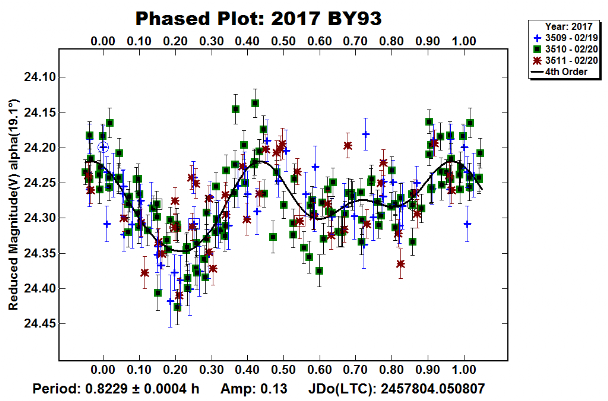 "Thanks to an alert from Jean-Francois Soulier, it appears that Comet 29P has gone into its brightest outburst so far this year, and looks to be about 13th magnitude. Checking recent LCO images, the event appears to have happened between September 20.40 and 20.80." Shown during the course of routine survey of this asteroid at JBL, we examined the images taken with the 12" Newtonian , we captured these images and reported to be at magnitude 13. That tightens the time down by a factor of 4 at least. A few nights later another outburst pushed the brigthness of the asteroid down to 11.6th mag. The brightest in 8.5 years. Later images were taken from 2 m Faulkes telescope to reveal the extend of the outburst. 29P/Schwassmann-Wachmann is a periodic comet near Jupiter (900 million km from the sun). Due to its great distance this comet should have been dormant with no signs of fuzziness (coma) around it. The usual run-of-the-mill comet will look like a comet (star with tail) when the it approaches the sun. The heat from the Sun melts the surface ice and sublimates to form the " tail " that is visible from earth. 29P/ is unusual since without the heat from the sun, the ice should have remained frozen but instead regular outburst of fan shaped gas can be observed. From the research conducted by Richard Miles, he postulated that this regular out-burst of gas and dust can only be explained by a mechanism called Cryo-volcanism. On earh, volcanism only involves extremely hot lava flow or molten rocks. 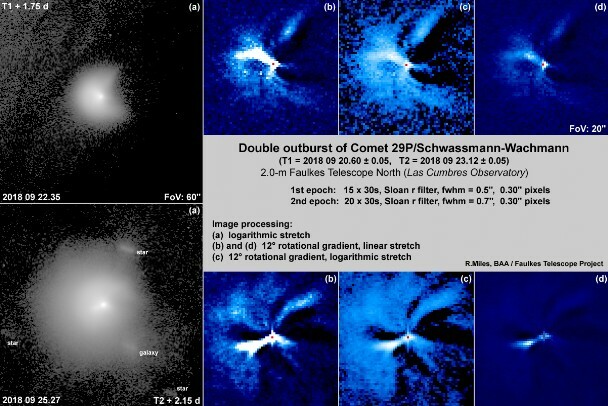 With a subzero environment and despite its distance from the sun, a complex dynamic interaction occurred between Methane, Carbon monoxide and Nitrogen causing a sudden eruption similar in appearance to a comet. This 3 framed animation show the night when one of such out burst recently occurred between 13UT and 15UT on the 20th September 2018. It increased the brightness of the comet from 16th magnitude to 13th magnitude. A fast moving Near Earth Asteroid that will approach us at a distance of 2.37 Lunar distance tomorrow. This asteroid is estimated to be between 47-150m in size is rotating at a rate of 0.823h per rotation. It is considered as a Super Fast Rotator and most likely to be monolithic .. compare to the regular rubble pile structure most asteroids of such size belong to. However with such low amplitude, could it be binary? (20325) Julianoey from Julian Oey on Vimeo. 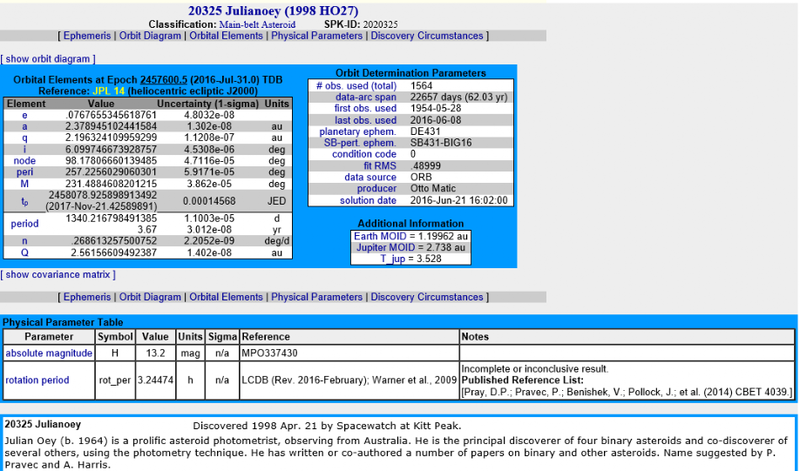 The asteroid (20325) HO27 was recently renamed to the author (20325) Julianoey. This animation was done using images taken on 8th of April 2016 in this year's apparition in which photometric work was done to capture the continuation of the events during the binary transits and eclipses. It is our pleasure to congratulate you on joining the "club" of those with named asteroids. The naming will appear on the Minor Planet Circulars issued today, and will be announced along with eight others at the banquet of the Binaries-4 Workshop in Prague this evening, sorry you won't be here to join in the celebration, but be sure that some fine Czech beer will be consumed in your honor. We attach a text of the nine naming citations that will be read at he banquet. 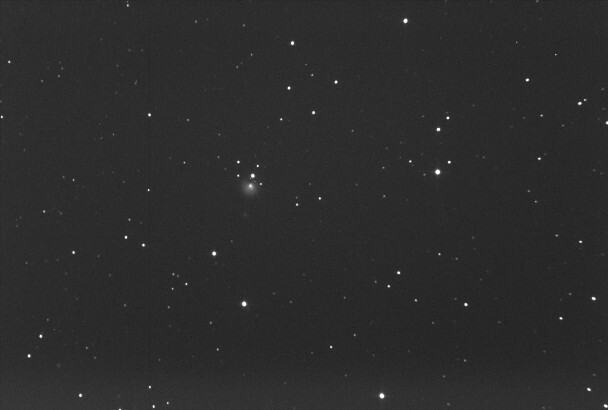 Observing campaign for comet C/2013A1 (Siding Spring) during close encounter with Mars. All astrometric observations of comet 209P (2014) has been published at Minor Planet Center. 192 CCD photometry observations of novae, supernovae & variable stars to the AAVSO . (American Association of Variable Star Observers). There were also 790 comet observations on 39 different comets. Work done by Paul Camilleri (The past winner of Berenice and Arthur Page medal) showing some of the interesting observations that were done at Blue Mountains Observatory. "I found very faint images of an main belt asteroid 2013 CX71 which was discovered in February with pre-discovery images dating back to early January from the SpaceWatch survey in the USA. 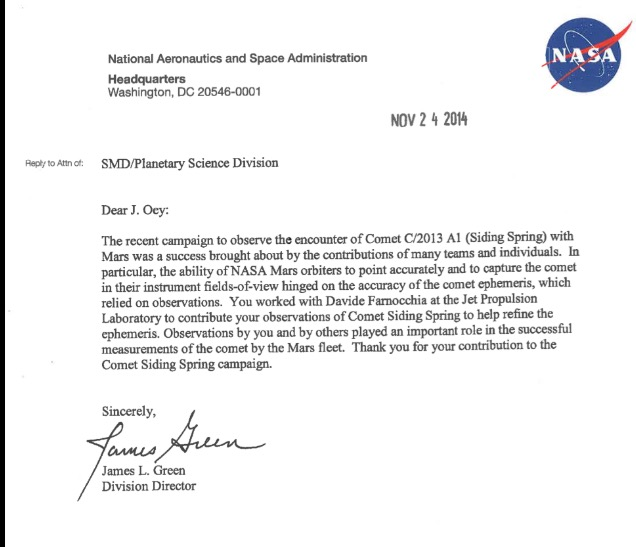 The orbital arc for this one was 32days and with our observational data from March 13th extended it out to 62days." Just one of the examples where Paul has expertly retrieved the faintest of asteroids found in the data obtained from BMO asteroid photometry studies.